ElectricVLab comes with the following pre-built circuits. They have been chosen so as to provide a walk through the core concepts and components of analog and digital electronics. Resistors connected in series and parallel. Push-pull amplifier using NPN and PNP transistors. The biasing diodes have been shorted here by closing the switches across them to see the distortion that happens in their absence. If you click on the oscilloscope, a window showing an enlarged view of the waveform gets displayed. This display also provides ways to change x and y scales, cursors, and trigger settings. Decimal counter using JK flipflops. The counter state drives the 7-segment display via a 7-segment decoder. 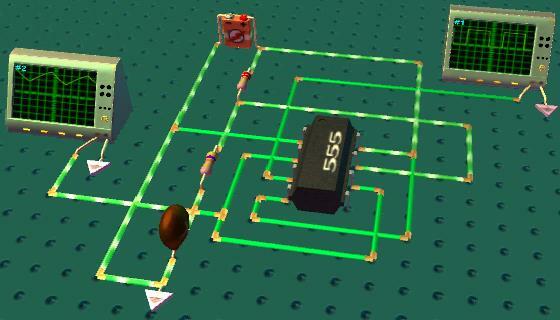 A 2-to-4 decoder that activates one of the 4 robots. Decimal Counter with JK Flipflops. Uses 7-Segment Display to Display the Count. Astable multivibrator (Pulse generator) using 555 timer. Adjustable temperature indicator using thermistor. Darkness Activated LED. Uses Photoresistor to sense the amount of light. Using the Virtual Oscilloscope in ElectricVLab to view the output of a sensor connected to Arduino board.